Guts Online Casino Review 2019 » $125 FREE + 100 Spins! In just a few words, Guts Casino is a safe and reliable brand that has the services to live up to the massive list of hit online pokies. No download is needed so that Australian players can dive right into the action and claim bonuses from the very first deposit. Guts Casino has something that many fans of pokies will greatly appreciate and that is a collection of games made out of the best options from multiple developers. Sites that can combine big brands get an advantage since players have a lot more styles to choose from. The site will show off its variety to new players from the moment they enter Guts Casino with the Featured category that is always a good place to start. Before we jump into the online casino review, there are a few details about Guts that need to be mentioned. It is a top brand that was established in 2013 and has licenses in Malta and in Curacao that apply to the Australian market. It is also licensed in the UK for even further reassurance of it being perfectly legal. The massive collection sustained by many providers is entirely in non-download and most of the games will run on iOS, Android and other mobile operating systems. There are several nice promotions available at Guts Casino and they start with the welcome package, as is usually the case. Here is where new players from Australia can make a first deposit and receive 125% for up to AU$125 and 25 free spins for Starburst with the code GUTSWE1. The second deposit bonus code is GUTSWE2 and it triggers 75% up to $75 and another 25 free spins. The third deposit will come with a bonus of 50% up to $100 + 25 free spins if the code GUTSWE3 is used. Finally, the fourth deposit bonus is of 200% for up to $100 and 25 spins for free with the code GUTSWE4. Once the welcome package is out of the way, users can get 40% up to $40 + 15 free spins with Second Strike every Monday, up to 60 free spins on Thursday and cashback on the live casino. We were blown away by the many games available at Guts Casino and most players will likely feel the same way when they see that the list keeps going and going while scrolling down on the page. The total goes over 700 options and it is impossible to get bored here since new games are added very often. Guts Casino allows customers from Australia to play on mobile and tablet. The website changes just slightly and it maintains its other sections as well. Of course, the online casino is the biggest hit and the great part about it is that it keeps a good part of the games from the standard version. This basically translates into more than 400 mobile casino games that don’t require apps or downloads. The developers powering the casino have very good mobile platforms with dedicated versions of their hot games. Pokies are always the ones preferred by players and with hundreds of them just a tap away, it is safe to say that Guts Mobile Casino is a hit. As for the supported phones, pretty much all of the modern smartphones available on the market today will easily run the mobile casino in their browsers. The flagship phones from Apple, Samsung, Nokia, Blackberry, HTC and other brands still provide the best gaming experience because of their impressive screens and specs. In addition to regular pokies, the mobile casino also has progressive jackpots, classic pokies, table games, video poker and even some of the tables with live dealers. Crossplay: Yes, one account is enough for accessing both mobile and desktop platforms. Joining Guts Mobile Casino will present the bonus offer of up to $400 and 100 free spins for the first four deposits. The first bonus is of 125% up to $125 and 25 Starburst free spins. Guts Casino doesn’t waste any time by offering complicated ways of accessing the mobile casino. 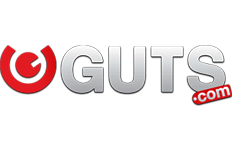 It just tells users to visit Guts.com on the mobile phone or tablet to gain access to the games. It really is this simple. Quick Tip: Make sure the web browser is up to date with the latest patches. Also, if there are any issues, Google Chrome is recommended for a smoother session. Accepted currencies include Australian Dollars, Canadian Dollars, US Dollars, Euros, Norwegian Kroner, Swedish Kronor, Denmark Kroner, British Pounds Sterling and New Zealand Dollars. English, Finnish, Norwegian, Swedish and German can be selected from the bottom row and there are also locations for Canada, Australia and New Zealand that keep the site in English. Also on the bottom row, players can find the option to start the live chat by simply entering their email address and selecting the topic. The support team is made out of skilled and knowledgeable agents who help provide a dedicated service around the clock. Email is an option for contacting as well. While the Guts Casino review revealed the fact that banking methods are a bit limited, the processing times for withdrawals are very fast. When most casinos take one or several days to process a request, Guts does it in two hours. This allows for the money to reach the client on the same day in most cases. The gaming platform is very smooth and it has easy ways to favourite games in order to have them easily accessible for future sessions. The category is shown on the bottom and it is joined by the games played recently, the hot titles on the casino and some recommendations. We can't help but be impressed with the collection of pokies at Guts Casino. Bringing so many developers to one place has a great result when it comes to game variety and we love that about the casino. We also liked that the bonuses are aimed at recreational players and don’t try to stand out with big maximum limits that only a few customers can benefit from. The best thing about the Australian casino remains the mobile version that works flawlessly on iPhone and Android devices. So many games can be available at your fingertips and some of them actually look better than they do on a desktop monitor. Some small issues we came across throughout the Guts Casino review include limited banking methods and a lack of support via phone. Play at Guts Casino with your $125 Bonus Now!